Today, I will write about a comedy after a long time. I introduce "TUTORIAL" who are my favorite comedian. 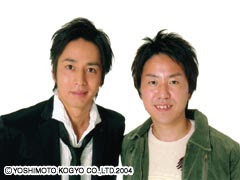 The person who is at the right is Mr.Hukuda and at the left is Mr. Tokui.They won the "Manzai grand prix 2006". So they are not only popular but funny. They came to Kansai Gaidai some years ago. I saw their autograph at student department room. I really want them to come Kansai Gaidai again. And Mr.Tokui is a very handsome man. He is the best of handsome in "Yoshimoto Company".I like him very much, however he is abnormal. His abnormal charactor is reflected their "Manzai". On the other hand, Mr.Hukuda is not a handsome man. And unfortunately his face is covered by oil. He is always teased his oily face. I really recommend their "Manzai". They are very very funny. So please watch their Manzai at M-1 2006.